Welcome to Bay John! Enjoy a wonderful afternoon on the screened In porch while watching the area wild life and sunsets. Bay John has all the comforts of home for your to enjoy, great beds, nice kitchen, and someone to clean when you leave. The perfect place to stay with the quite of country life in the city of Gulf Shores, Al. This unit is all about location, locastion. Come visit for a special trip. This property is in a unique setting away from the crowds, but within 10 minutes of the beautiful white sandy beaches of Gulf Shores. This unit is a large 1980 square foot 3 bedrooms, 3 baths with lot's of extra's that will make you feel right at home. Master has king and trundle bed that sleeps two. Guest has queen bed. Third bedroom has twin bunk beds and a trundle bed. Living room has sleeper sofa. Lounge by the screened-in pool with great furniture and Jacuzzi. The exercise facility is fully equipped and has 2 televisions with full cable. The pier is lighted for night fishing, dinners or just good ole fashion relaxing. Restaurants, water parks, zoo and outlet shopping are only a few minutes away. Boat and jet-ski slips are available. Everything was pretty good. We just had a cracked coffee pot and it would be have been excellent if the rental place provided travel shampoo/conditioner. WE LOVE GULF2BEACH! OUR CONDO IS GREAT! IT HAS A GREAT VIEW ON THE BON SECOUR RIVER. WE SEE DOLPHINS ALMOST DAILY ON THEIR SWIM TO THE GULF. IF WE HAVE ANY ISSUES G2B IS VERY QUICK TO RESOLVE THEM! THE STAFF IS FRIENDLY AND ALWAYS HELPFUL!! We love staying in the Bay John complex. There are only 28 units, so it's easy to get to know others also staying here. We also have a great view of the Bon Secour river. We often see dolphins around 8 am and also 4 pm! We also see Ospreys and Pelicans, and other birds, and ducks. If we have any issues in the unit, we just have to make a call and Gulf2Beach sends someone out immediately. We plan on returning here each year for as long as possible. WE LOVE BAY JOHN CONDOS! IT ONLY HAS 28 UNITS (4 FLOORS). SO IT'S MUCH MORE COZY THAN THE HUGE MULTI STORY CONDOS! THE PEOPLE HERE ARE VERY FRIENDLY AND WE HAVE A GREAT VIEW OF THE BON SECOUR RIVER WITH LOTS OF WILDLIFE. THE RENTAL COMPANY IS 4 STAR IN OUR BOOK. IF WE HAVE AN ISSUE WITH AN APPLIANCE OR PLUMBING, THEY ARE VERY QUICK TO RESPOND WITH THE APPROPRIATE PERSON TO FIX IT. THEY ARE ALL FRIENDLY AND PROFESSIONAL. WE'RE HOPING TO HAVE A LONGTIME RELATIONSHIP WITH GULF2BEACH! OUR CONDO WAS REALLY SPIFFY WHEN WE ARRIVED. WE LOVE OUR HOME AWAY FROM HOME! Everything was as described. Only issue we had was with the television in the living room. It would not work when we arrived but we discovered the part that connected it to cable or satellite was plugged into a plug that was connected to a light switch so if the light switch was off then the television would not work. We did call the management company and they were sending someone out when we discovered the problem. Could have used a few more towels with 10 people in the unit. We loved being able to fish from the peer day and night (our grandson stayed out every night past midnight). Saw dolphins from the balcony. The pool and hot tub were great. The rental company was very professional and helpful any time we called with our booking also after we arrived I found out that no trailers were allowed at the property but they assisted me with that also. 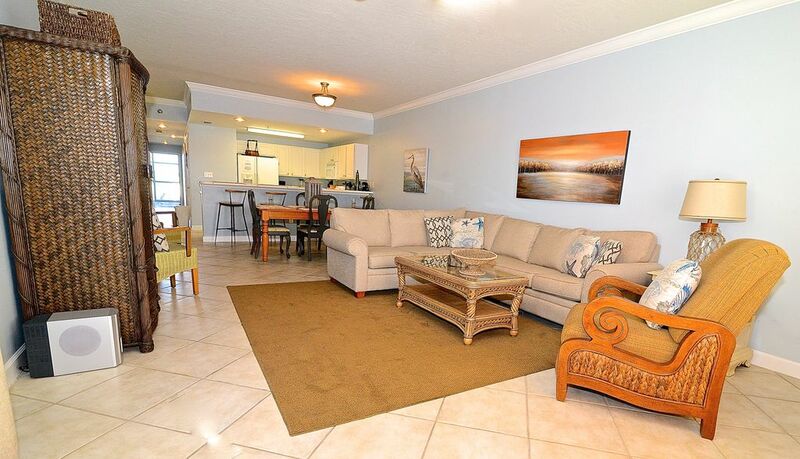 The condo and the property was centrally located to the beaches, attractions and restaurants. We loved the balcony view and the pool. The atmosphere was great along with the locals. Thanks for a wonderful place we will definitely return. Plenty of room in condo.